So we have our first breather episode after the intensity of the 6th and a prophecy involving classic Chinese dragon lore. 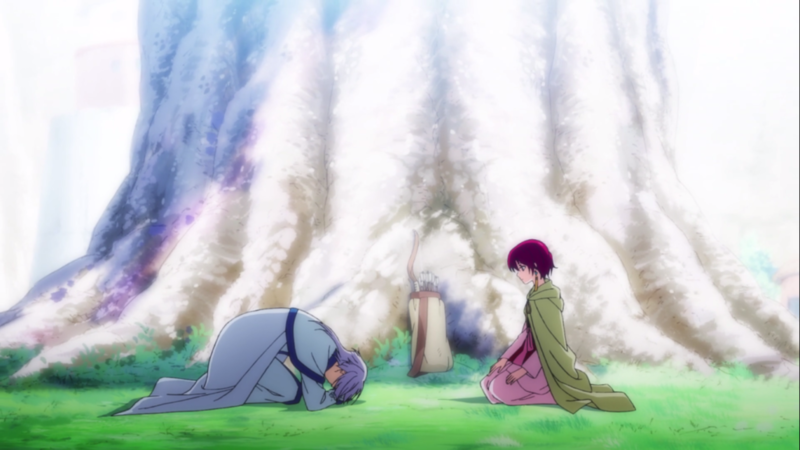 Yona is scolded by Yun, affirming to her how rude and naive she’s been about her own country and as his guest while Hak heals from his injuries. Ik-su tries persuading Yun to let up on Yona considering her circumstances while Yona ruminates on her behavior as of late. I can understand people still not being very fond of Yona, her character development throughout the series is definitely a slow one but refreshing by the end. She’s still clumsy and cries alot in this episode but this is more or less the springboard episode. She didn’t start out being powerful, there’s not quick montage or just a few episodes spend on training and boom! She’s a great fighter! Then the rest of the series is her taking every chance she’s given to get her throne back. Sure, it looks cool but story-wise it’s the anchor of most Shōjo anime with their characters and it can get predictable and boring. 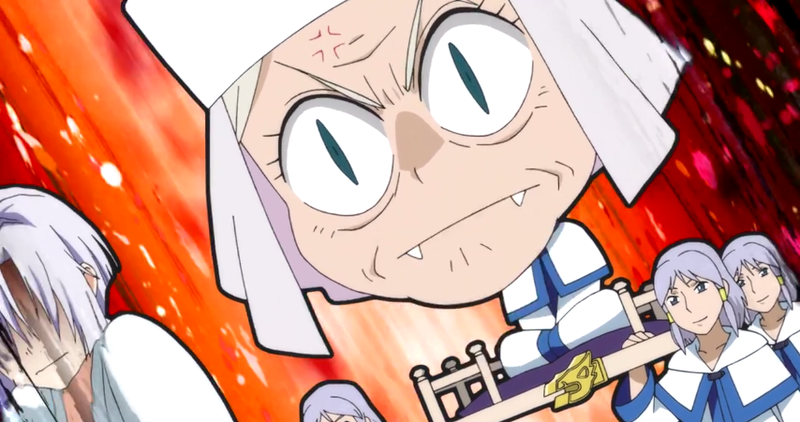 The growth of her strength isn’t tested every few episodes with a boss fight either, the time is taken to develop it in a lot of smaller ways which is why I regard it as more realistic than most anime hero stories. 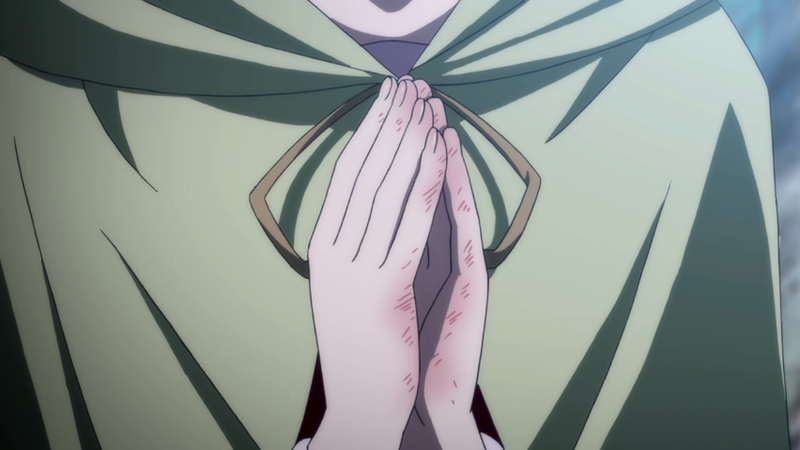 (that I’ve seen) Now that Yona has cut the ties she had to her old life, she’s realizing everything she’s been incognizant of, and that’s going to take a few adjustments. But she is determined to get stronger and sure she could do it on her own but what’s the fun in that? How would she be able to fight for her kingdom if she doesn’t ask for their help? 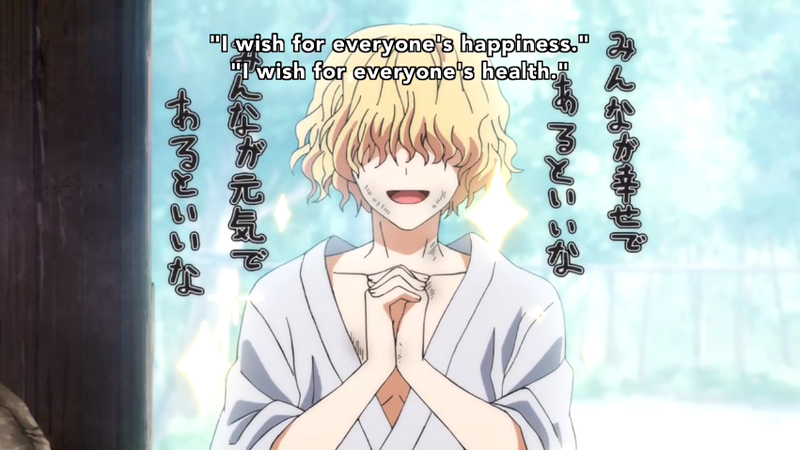 So it’s a slow burn yes, (much like Hak and Yona’s romance as well ;;) ) but I say try and stick with it, it gets better. 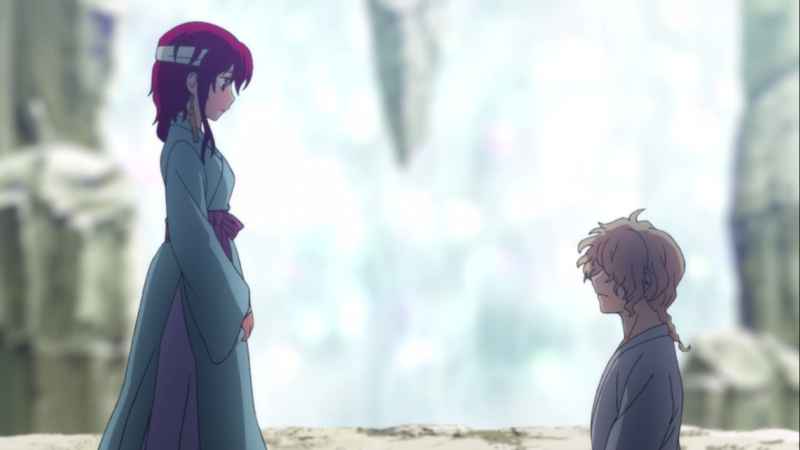 So Yona goes back to Yun and thanks him for taking care of Hak and asks to learn more about the oracles of the kingdom. Yun gives a bit of backstory about how powerful of an authority the oracles used to have before the royal council had to kick them out fearing they’d be usurped. He also hints at how Ik-su’s need to help people through his fortune telling is almost obsessive if he’s not with him to knock Ik-su down if he flies too high. In the evening, Yona wakes to find Hak is gone and runs to look for him, fearing he’s injured himself further then yells at him for not telling her where he went. With this scene, you could say she’s being a crybaby because her protector isn’t next to her but I think it’s more about familiarity and stability in an overwhelming situation. Hak has been with her since they were both children, through losing her father and her home, she’s alone in the world without him and she’s realizing just how much she has to learn about her kingdom to take it back, she’s not a great fighter but she wants to be and she needs her only friend to get through it. While Hak lets his feelings for Yona seep through a bit but Yona is still naive to the fact and we have more comedic subversion. Then a sweet moment with Hak apologizing for her hair and Yona remarks about how much lighter she feels now. It’s a subtle but organic emotional beat for her. 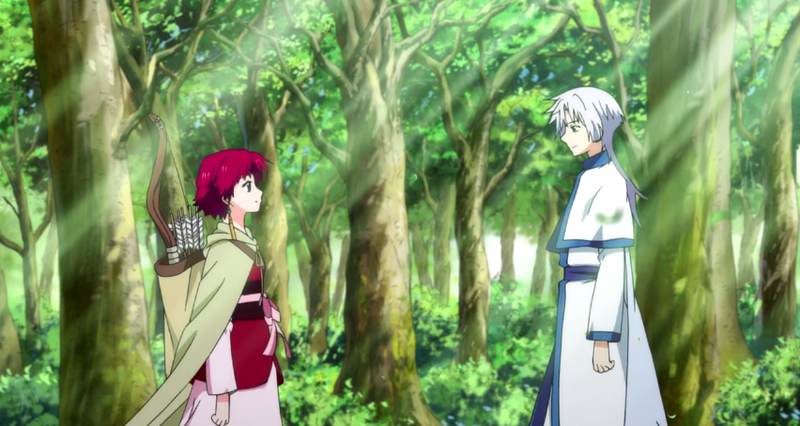 As Ik-su tells Yona of her destiny and the legend of the dragons, this is where the journey kicks off. 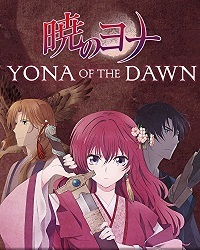 This is also how much better (in my opinion) the anime is to the manga because, in the opening of the anime, we already know that Yona will find the dragons, the question is how? and watching the characters grow and change in their quest, it’s tastefully done foreshadowing. 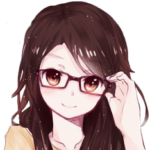 In the manga, we don’t have a strong enough character set-up to care early on and the prophecy is supposed to come off as this great important calling when it’s really just weak and predictable so there’s no mystery or suspense of if they will succeed or fail but the structure of the anime makes it so it doesn’t really matter. The focus is kept on the characters which help the story flow better. 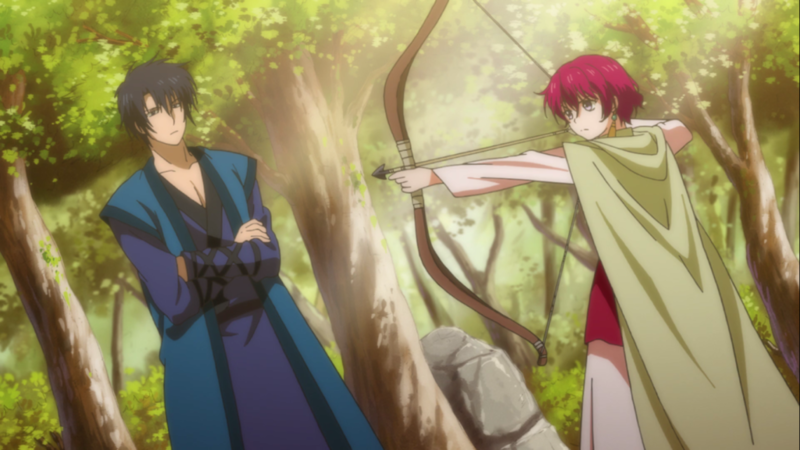 So Yona solidifies her choice in gaining strength and determinedly asks Hak to train her. 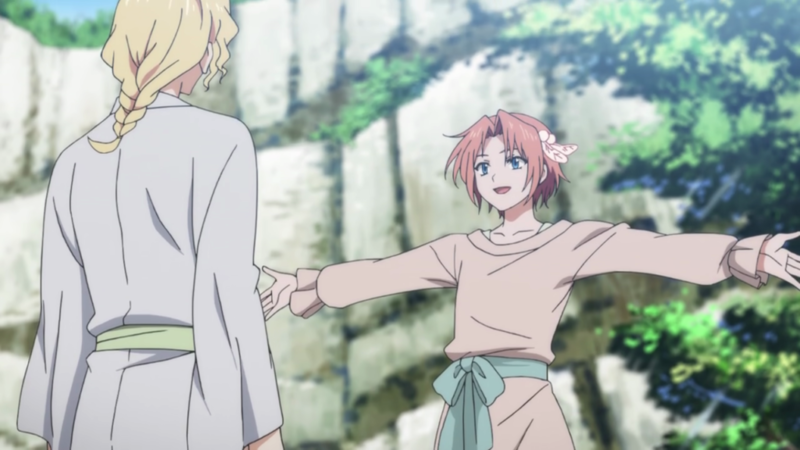 There’s a small anime-only scene of Yoon asking Hak how he can stay with Yona, being as weak as she is and unable to protect him if he needed it. Hak insinuates to him how you always want to protect the people you love, despite their annoyances, implying how deep the connection of family can be. 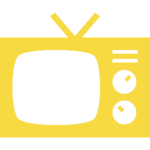 An episode where our two main leads, for the most part, take a back seat for us to learn more about Ik-soo and Yoon. Ik-soo asks Yona and Hak to take Yoon with them on their journey, thinking his bumbling nature hinders his potential. Their relationship is the most endearing inspiration for anyone who’s had an older sibling. Yoon was always on his own and yearning for something until Ik-soo came into his life. With oracles being banished from the capital, Ik-soo spent his days traveling to continue to spread the word of the gods to the people, encouraging compassion towards others. Dumbfounded by Ik-soo’s kind-hearted composure as he tried to rob him for money, a young and guarded Yoon treats the head wound he caused from throwing a rock at his head. In exchange, Ik-soo teaches Yoon how to make sandals and promises to return from his travels with books for him to read. Right from their first interaction, it’s evident they would make a fine pair of brothers. Yoon starts to trade more from selling the sandals he makes while waiting for him to come back, realizing how lonely he was. Ik-soo returns in tatters from being robbed of all the gifts he was bringing to Yoon; thinking it’s best to stay away from people for a while due to their greediness, he says goodbye to him. But noting how clumsy he is, that he can learn all he needs from him, and ultimately that he doesn’t want to be left alone anymore, Yoon begs Ik-soo to stay with him. Then we have a gorgeous farewell scene. In such a short amount of time, they had impacted each other’s lives so much, Yoon knows he’s right but is still torn about leaving him on his own. Ik-soo comes to bring him new sandals he had made for the journey, Yoon retorts how his aren’t much better and makes him a new pair as well. Skipping with joy, Ik-soo trips yet again but doesn’t fall this time, showing Yoon he can stand on his own two feet just fine. Both of them crying over Yoon having to leave this time and how lonely Ik-soo will be. It’s a cute reversal. So Hak, Yona, and Yoon say their farewells, with Yoon taking up the helm and Ik-soo smiling softly watching them leave. Now we’re off to find some dragons! 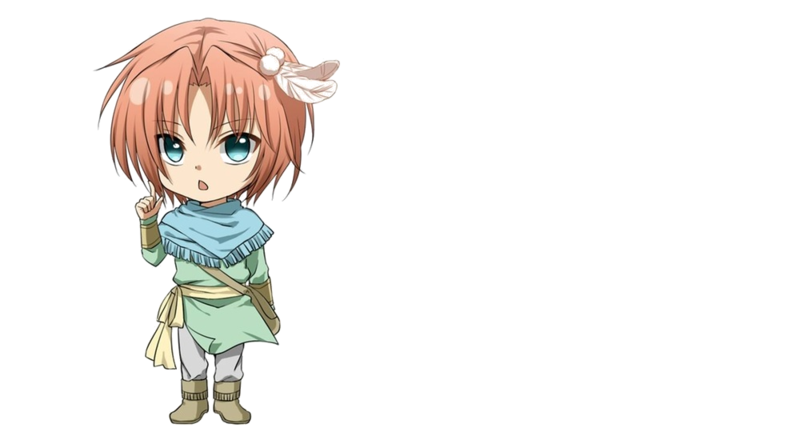 A detour is taken between them discussing the village they need to travel to find the first dragon and Yona asking Hak to finally teach her how to defend herself, to restock supplies and Hak goes to buy more weapons. Yona reassures him of her confidence in fighting if he’s ever in danger, which Hak brushes off as nothing of importance since he’s her bodyguard. He’s going to protect her, not the other way around. (It’s not so much a sexist attitude as much as Hak may feel he’s not fulfilling the role the king had given him otherwise.) A fog appears in their path, they find Yoon has disappeared, and are suddenly surrounded by a group of white-haired archers. Yona says the oracle sent them and noticing Yona’s crimson hair, the elder reveals themselves to be the guardians of the White Dragon. So in agreement to take her to the dragon’s village, we end on a cliffhanger with a glimpse of the white dragon himself. Look at this girl putting in that work! The white dragon has a memory of his father, telling him of his destiny by his right hand, explaining how his blood will cry out for its master and it is his soul bound duty to protect the king when the time is right. He awakens to his dragon hand burning and thanks his father and the previous generations for giving him the honor to meet their master in his lifetime. Yona is intrigued by his almost ethereal appearance, and tells him as much, leaving the white dragon flabbergasted at his master’s words. Yona corrects him in her position, she is not his king, merely a fugitive, on a quest to reunite the dragons and asks simply for his help in doing so. The white dragon makes a vow to be devoted and serve her in whatever way needed as the blood in his veins commands him. As the celebration is being prepared, white dragon tries to be rid of Hak through bribery, sighting how his services are no longer required. Here begins the comedic rivalry! Yona abruptly denies Hak departing from the group, affirming how much of an important friend he’s been to her, satisfying Hak’s ego. The next morning, everyone comes to see their dragon off and we get a sweet farewell scene with him and his grandmother. Similar to Yoon and Ik-soo’s, it’s such a nonchalant conversation with some subtext that blossoms to the surface in a beautiful flow towards the eventual words of goodbye that’ll leave a lump in your throat. (If a beautiful genius such as Yoon can tear up, you can as well!) As they come to a fork in the road, the white dragon reveals that he can sense the location of the other dragons, them being blood brothers then Yona asks for his real name. Taken aback by her humble question, thinking how no one else had cared about such a thing, only what his title had said about him. I love this small moment, it really showcases Yona’s kindness and how grounded she’s become since leaving her superficial environment of the royal palace. She’s gained a new perspective on her people and doesn’t see them as insignificant servants; including the dragons she needs to find, starting with the first. 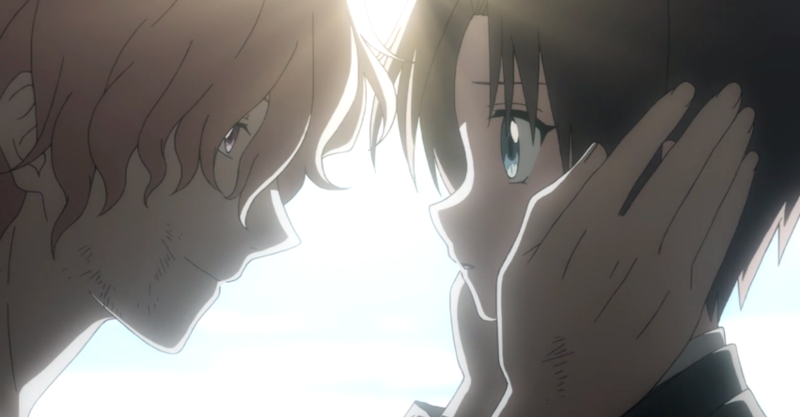 He was prepared to serve his master, his first act towards her being to lower himself, but before they begin their journey together Yona takes the time to establish them as equals. She doesn’t see him as her servant or a mighty dragon, he’s simply a boy named Giya sweet enough to give her a helping hand. This was a really funny episode! So many zany shenanigans from the villagers who worship this white dragon deity, the grandmother was definitely the highlight!